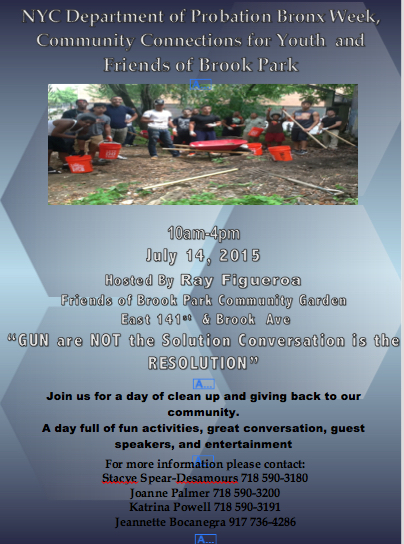 Join us for a day of clean up and giving back to our community. 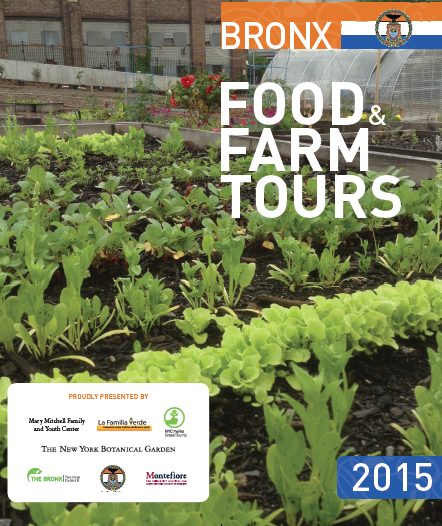 Our Youth Tour will feature the inspiring work of young people who are gardening in The Bronx. First, pay a visit to the chickens and bees at Brook Park, a community garden serving countless youth each year in activities ranging from gardening, environmental, and waterfront activism, to arts and cultural events. Next, enjoy lunch while visiting the children’s garden at historic Bartow-Pell Mansion Museum. Finally, we will close at the recently renovated New York Restoration Project’s Willis Avenue Community Garden. More, click here. United Playaz of New York and Young, Fresh and Conscious are local organizations in the community dedicated to empowering youth, supporting families and cultivating leadership. 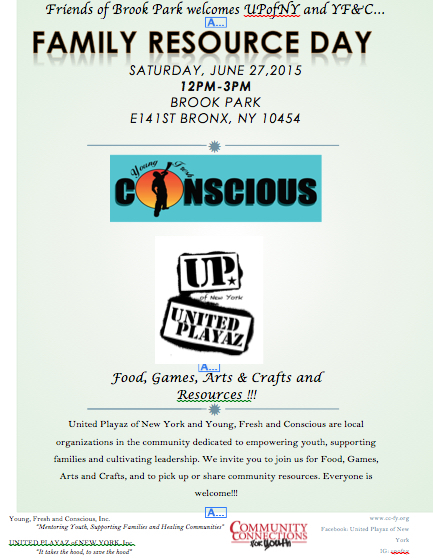 We invite you to join us for Food, Games, Arts and Crafts, and to pick up or share community resources. Everyone is welcome!!! The bright-green stalks and leaves are tended by a dozen teenage boys who water, lay mulch, pull weeds and wait. If all goes well, more than 300 pounds of serrano peppers will be harvested in August from the Brook Park community garden in the Mott Haven section of the Bronx, one of the poorest neighborhoods in the city. Then they will be sold to a New York City-based hot sauce maker for $4 a pound, the proceeds of which will fund small stipends for the teenagers. 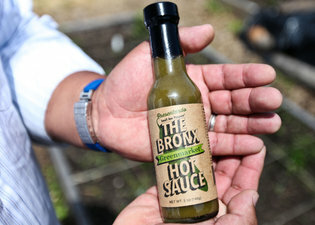 The resulting product, Bronx Greenmarket Hot Sauce, has become a staple at the city’s farmers’ markets, and in the shops and restaurants on Arthur Avenue, including at the Bronx Beer Hall, which serves it with crispy-battered dill pickles, French fries and burgers. Since May, the olive-green sauce has been added to the shelves of the Whole Foods stores in Union Square and TriBeCa, with more locations in the works; a five-ounce bottle sells there for $6.99. The initial yield of 5,000 bottles, made in October in Kingston, N.Y., has nearly sold out. The for-profit maker of the sauce, Small Axe Peppers, plans to produce 30,000 more bottles later this year in Long Island City, and is calling on community gardens in the Bronx to provide 5,000 pounds of the key ingredient. The Bronx Greenmarket Hot Sauce is the result of an unusual collaboration between a group of friends and the city’s farmers’ markets. Small Axe Peppers was started last year with $70,000 by John A. Crotty and John Fitzgerald, affordable-housing developers in the Bronx, and others, including Todd R. Snyder, an investment banker. Mr. Crotty, 47, said they wanted to find a way to support community gardens, which often struggle to stay open on tiny budgets. King Phojanakong, the chef and owner of Kuma Inn in Manhattan and Umi Nom in Brooklyn, was enlisted to create the hot sauce. Mr. Phojanakong, 46, was a childhood friend of Mr. Crotty’s, and graduated from the Bronx High School of Science. But while Mr. Phojanakong served fresh hot sauces nightly at his restaurants, he had never bottled any of them. So he and Mr. Crotty took a road trip to Geneva, N.Y, to consult with agriculture experts. A pepper specialist there said the serranos were suited to the Bronx climate, and relatively easy to grow and harvest. Back in the city, there were some setbacks. Mr. Phojanakong tested more than a dozen recipes before he was satisfied with one, only to have its taste and texture altered by the pasteurization process. He started over. The final recipe was created in two months, and had just five ingredients: serrano peppers, apple cider vinegar, garlic, onion and salt. Small Axe Peppers partnered with GrowNYC, a nonprofit group currently running 50 greenmarkets across the city, to find community gardens and farmers to grow the peppers, providing them with starter plants paid for by Small Axe. The group also connected the company to marketing and distribution experts and buyers. GrowNYC gets a share of the hot-sauce profits, which it plans to use for programming. Elly Truesdell, who holds the title “local forager” for Whole Foods in the Northeast, said that the goal of the hot sauce to support local growers made it a good fit for Whole Foods. Ms. Truesdell, a fan of serrano peppers, was also won over by the flavor. “It brings a nice balance of heat, and is different from a lot of other hot sauces we carry that rely on habaneros, and in some cases, ghost peppers, for intense spice,” she said. Last year, only a handful of community gardens produced the serrano peppers, forcing the company to turn to farmers to supply the rest. But this summer, 22 community gardens have signed on. 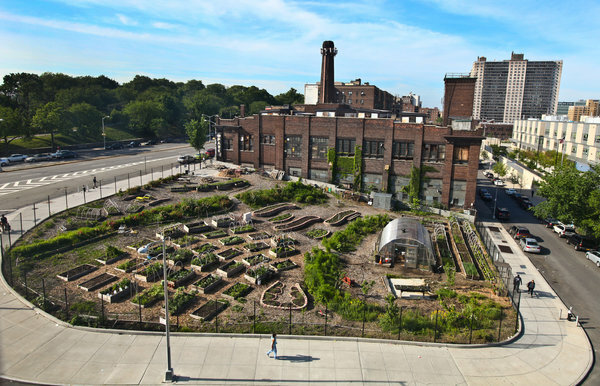 New Roots Community Farm, a half-acre garden on the Grand Concourse, stands to raise $600 from the peppers — double its profit from selling greens, tomatoes and herbs at a local farmers’ market last summer. The money will be used to supplement the garden’s $4,000 budget for seeds, tools and building materials, said Kathleen McTigue, who oversees the garden. “This is a very clear lesson on how to partner with other groups to make money,” said Ms. McTigue, a program manager for the International Rescue Committee. The prized plants receive special care; their roots are soaked in an organic fish emulsion to give them an extra fertilizer boost before being placed in four communal beds. Carmen Tirado, 68, a retired special education teacher, said she does not even like spicy foods, but planted a few of the pepper plants in her own plot to support the effort. At Brook Park, 100 pepper plants have taken root in a corner of the garden known as the “youth farm.” Their primary caretakers are teenagers with criminal records who were sent to work in the garden through a court order as an alternative to incarceration, said Ray Figueroa, a program director for Friends of Brook Park, which runs the garden. A few of them have completed their requirements but continue to come. Because of an editing error, an earlier version of this article misstated who attended the Bronx High School of Science. King Phojanakong graduated from there; John A. Crotty did not. East 141st @ Brook Ave. UpBeat NYC’s June outdoor neighborhood concert will feature performances by UpBeat’s Youth Orchestra, Children’s Violin Ensemble, Youth Wind Band and PreOrchestra Children’s Choir. Please join us in the beautiful community garden, Brook Park, for great music, food and family fun! In case of rain, the event will take place the following day on Sunday, June 14th, 4pm. People’s Climate Movement New York is proud to announce an impressive roster of Special Guests for this Sunday’sSummer Supper Party! Join them this Sunday to get up close and personal with some of NYC’s top climate justice leaders working locally, nationally, and internationally with Frontline Communities, Organized Labor, and Arts, building a movement together for a better climate future. Sean Sweeney. Sean is the Director of the International Program for Labor, Climate and Environment at the Murphy Center of the City University of New York. He also coordinates Trade Unions for Energy Democracy, a global network of 33 unions from 15 countries who are fighting for social ownership and democratic control of energy resources, generation, infrastructure and options. He has coordinated global union efforts to challenge climate change. Rachel Schragis. Rachel is an artist, cultural organizer and native New Yorker who came to social movement work through involvement in the Domestic Worker Justice movement and Occupy Wall Street. 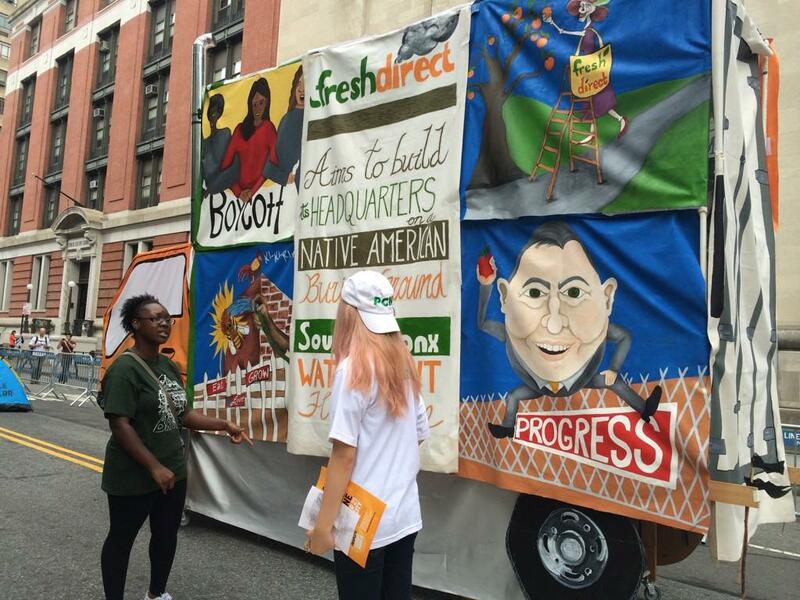 She is deeply committed to lifting up creative leadership around the climate crisis, most recently as the arts coordinator for the People’s Climate March and a founding member of People’s Climate Arts. Ray Figueroa. Ray is the President of the NYC Community Garden Coalition which represents over 800 community gardens, has a long community organizing history. 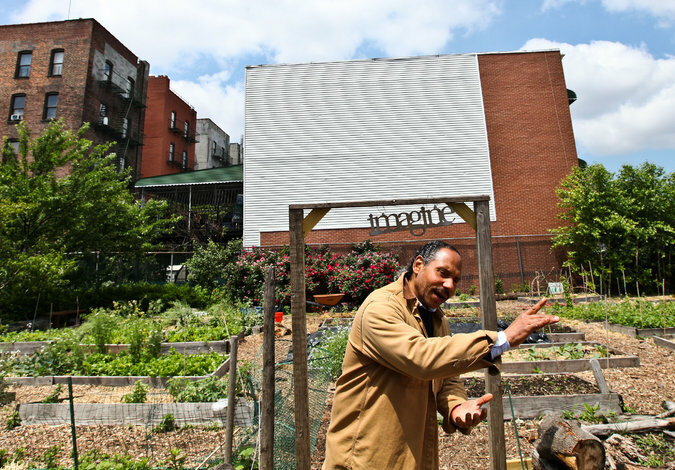 His woth with Friends of Brook Park, in the South Bronx, includes community alternatives to incarceration, creating gardening programs engaging formerly incarcerated people in productive community work. Climate activism is a logical extension of challenging the system to make it work for people not profits. Elisabeth Peredo Beltran. Ely is the Executive Director of Fundacion Solon in La Paz, Bolivia, and has led in climate justice efforts in Bolivia and beyond. Through socially conscious art and natural and social science research Ely has brought attention to the dangers of fracking and the importance of Bolivia to lead in renewable energy. Ely, a social psychologist, has worked with domestic workers and on gender and race issues and serves on the board of Food and Water Watch.